The sculpture "On the Banks of the Nile" by Egyptian sculptor Mahmoud Mokhtar was sold for £725,000 at Sotheby's auction house in London this week. Created in 1921, the sculpture represents an Egyptian peasant woman, the emblem of Egypt’s nationalist movement, who stands tall, poised to adjust her veil, revealing her feminine beauty whilst carrying out the menial but essential task of sourcing water from the Nile. The sculpture had been estimated to sell for £120,000 - £180,000 by the auction house; the final price is a record sale for the artist. 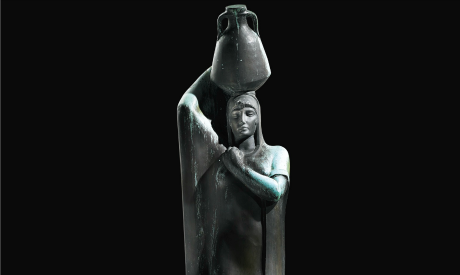 Another work by Mokhtar bearing the same title (On the Banks of the Nile) and representing another peasant woman in a different pose carrying a water jar, was sold in December 2015 at auction. It had been estimated to reach £30,000 -- £40,000 but sold for £317,000, also becoming the star piece of the auction.